Conor McGregor aka The Notorious has been undertaking an intense training programme to prepare to take on Khabib Nurmagomedov this weekend. The McGregor vs Nurmagomedov is due to air at around 3am BST on Sunday 7th October. The Notorious is an Irish mixed martial artist and is currently signed to the Ultimate Fighting Championship (UFC). A few weeks ago, he took time out of his busy training schedule to post about Cleto Reyes boxing gloves to his 25 million Instagram followers. 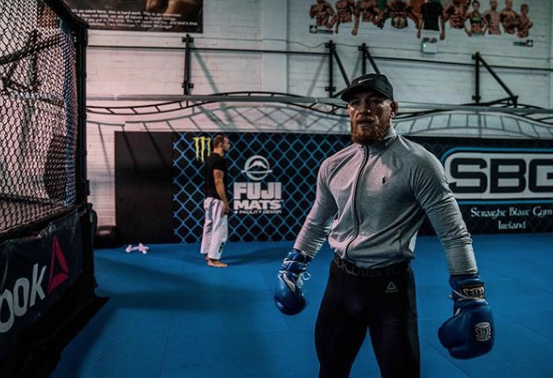 Conor McGregor shared a picture of himself donning the Reyes gloves during a training session. He swapped his usual MMA gloves for the pair of Mexican boxing gloves, similar to those worn by the legendary Muhammad Ali. In his Instagram caption, the Dubliner briefly explained the back-story of Cleto Reyes boxing gloves. He also shared other reasons for his love of Mexico. Conor McGregor says he enjoys the “fit and feel” of Cleto Reyes boxing gloves and describes them as “some top big gloves”. Cinco de Mayo is an annual celebration to commemorate the Mexican army’s victory over the French empire and McGregor’s son was born on the same day as these annual celebrations. Conor McGregor has been a pro since 2008 and has achieved 18 wins by KO, one by submission (RNC) and 13 first round finishes. After a brief stint working as a plumber, he pursued his boxing career, which is the only thing he’s really felt passionate about and driven by. The Notorious is the former Ultimate Fighting Championship (UFC) featherweight and lightweight champion. He has also competed as a welterweight in mixed martial arts (MMA), and light middleweight in boxing. He describes his intense training schedule as “Food, Afternoon session, Food, Evening session, Food, Sleep, Repeat”. It’s a training programme which must require a vast amount of determination as well as the right boxing gloves and training equipment. The Notorious has already caused a stir this week by turning up half an hour late to the fight’s press conference. His opponent Khabib Nurmagomedov stormed off the stage, refusing to wait for ‘nobody’. When McGregor finally turned up he happily answered questions for a solid 30 minutes. We’re very excited about this weekend’s fight and it’s great to see the No. 2 ranked pound-for-pound fighter in the world sporting a pair of Cleto Reyes boxing gloves. We love his choice of the blue lace up gloves and we stock a variety of colours to suit every taste, including lace up and velcro styles. Why not see if you agree with The Notorious and also enjoy the fit and feel of Cleto Reyes boxing gloves?